Any suggestions on things I should change or add? This reminds me very much of Whitebase from Gundam. I love it! Wow those 2 ships look a lot alike. Hmm I'm gonna make a few changes so they don't look so much alike. I guess that's a popular ship design. 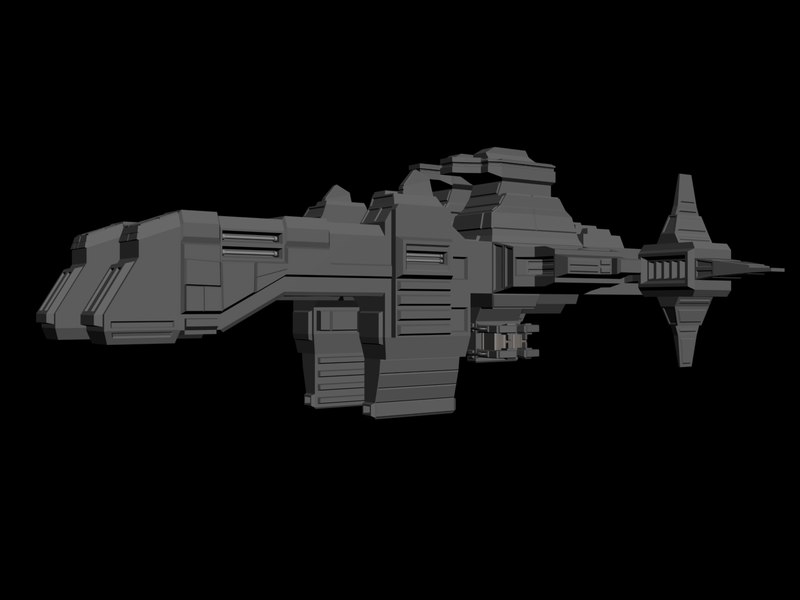 How do you think it would look if I shortened the 2 turret arms in the front to make it look more barge-like? Maybe add a walkway between the control towers. Very nice job. 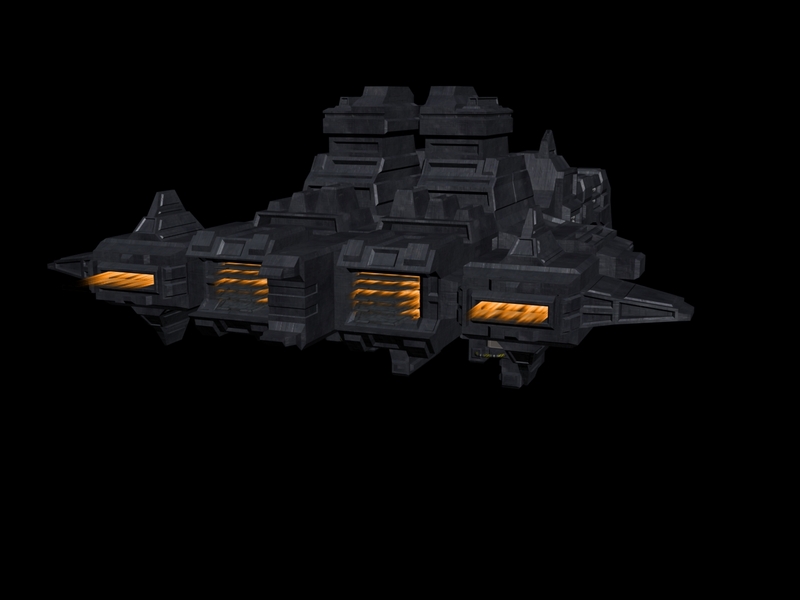 Though I agree that it looks a bit too much like that other ship from EVE. I'd suggest adding a bit more of a midsection in-between the towers and the two hull pieces (below the hanger) to make it a bit different. Other than that I love it. If you get the chance try an asymmetry ship next :D I haven't seen many of those. Thanks for the suggestions. 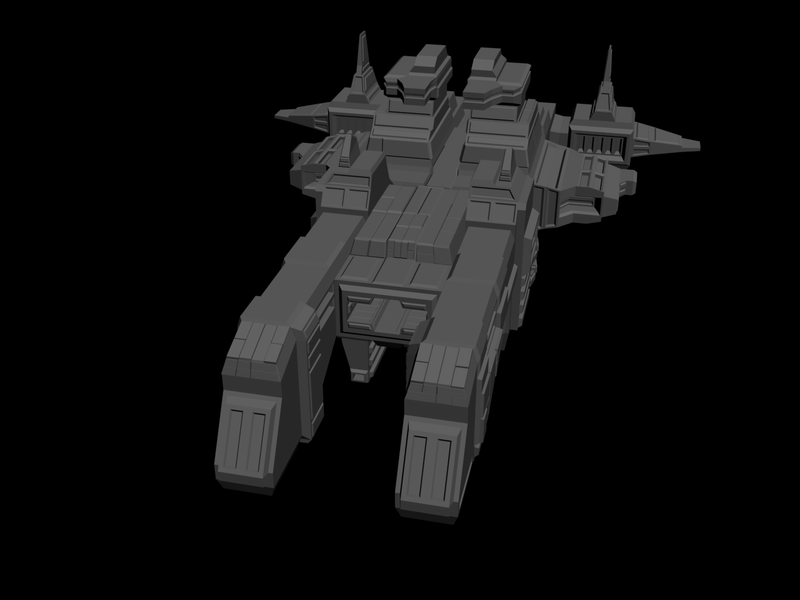 I do play EVE Online so maybe I subconsciously based some parts that I modeled off of that ship. 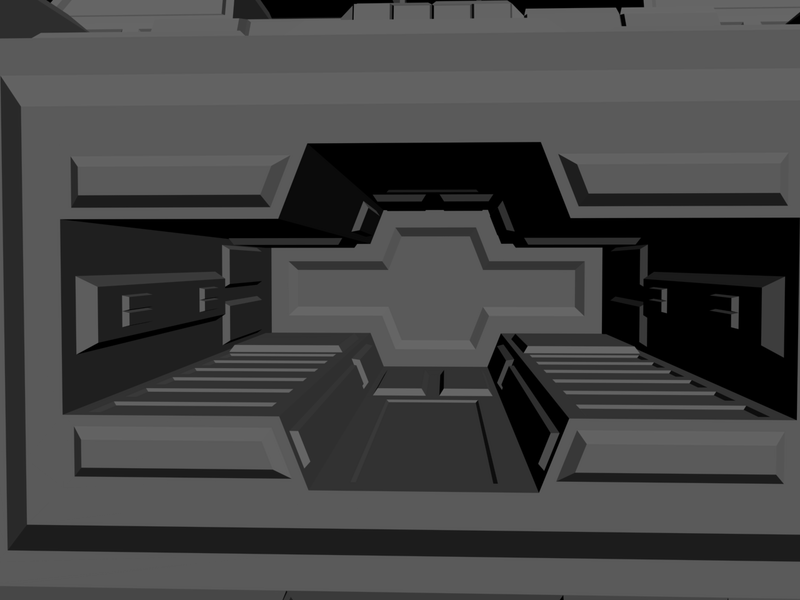 0_o Right now I'm working on making lines of cargo racks on the bottom of the ship. Another idea I had was that those huge claw things on the bottom of the ship could be used to latch on to asteroids then a giant drill can extend from in between the claws, drilling deep tunnels into the asteroid. As for textures, something I have been experimenting with is taking photographs of parts on construction equipment then generating normal and specular maps for them and making them tile seamlessly. It really has that cool gritty look to it. After looking at it a bit more, I'd say leave the arms like they are. It would give smaller craft some additional protection while they are leaving the ship, but also gives them room to maneuvar. Behind-the-scenes, the tips of the arms could house gyroscopes to assist with changing the ships directions (additionally, you'd want to have a larger gyroscope closer to the center of mass). The gyroscope thing isn't really something that'd you'd need to model for though. You haven't added any gun racks yet, though I imagine you will since you mentioned it. I would suggest missiles, flak cannons, or machine guns. Space battles would likely take place over large distances and would likely have fast speeds, so the general idea is you'd want weaponary that either tracks its target, or you want to fill (blanket) the area with fast moving particles. Since there is very little particulate matter in most of "space" you don't have to worry about friction slowing down or deterioting any weapons. With that said, I'd imagine lots of tiny, but fast moving, weapons/ammunition would be better than slower moving, but more massive "artillerly" shells. Now, I'm using these terms from a relativistic point of view. The "tiny, but fast moving" ammunition that I mentioned could very well be what we'd consider artillery-sized shells now. Thinking about it some more, large shells would be useful against large ships like this one (really!? lol), since the acceleration would be pretty crappy in relation to the velocity of a projectile; however, since lasers move at the speed of light and can impart energy (lasers are used to cut sheet-metal), they could be used to destroy projectiles. Thanks for all the info, it will really help. 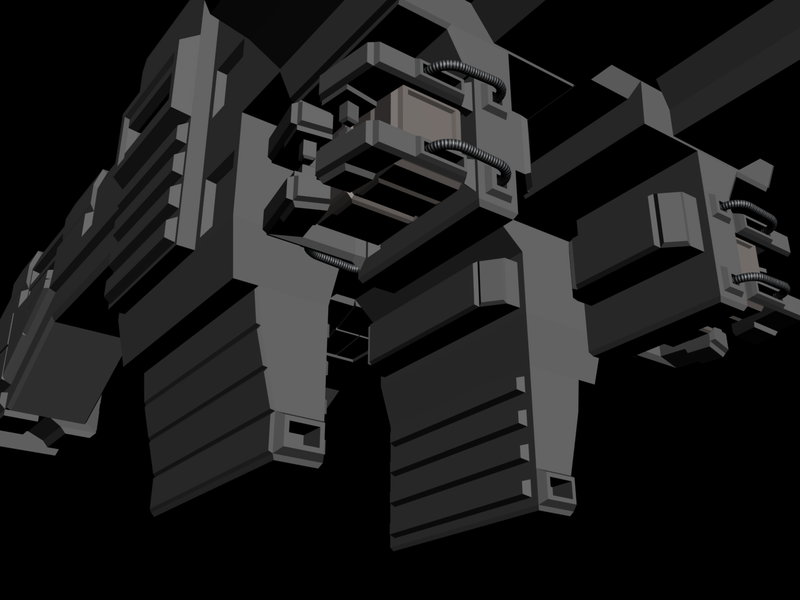 I have made some more progress on the ship. 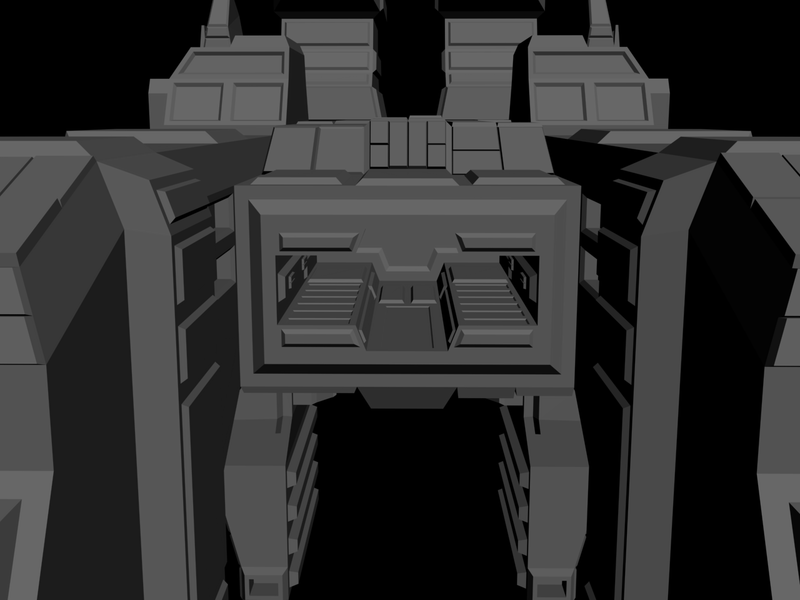 I'm nearing completion of the rear thruster area of the ship. By the way, when you said "heat fins", is this what you meant? (look at screenshot)I sure hope so because I spent way too long on that texture. 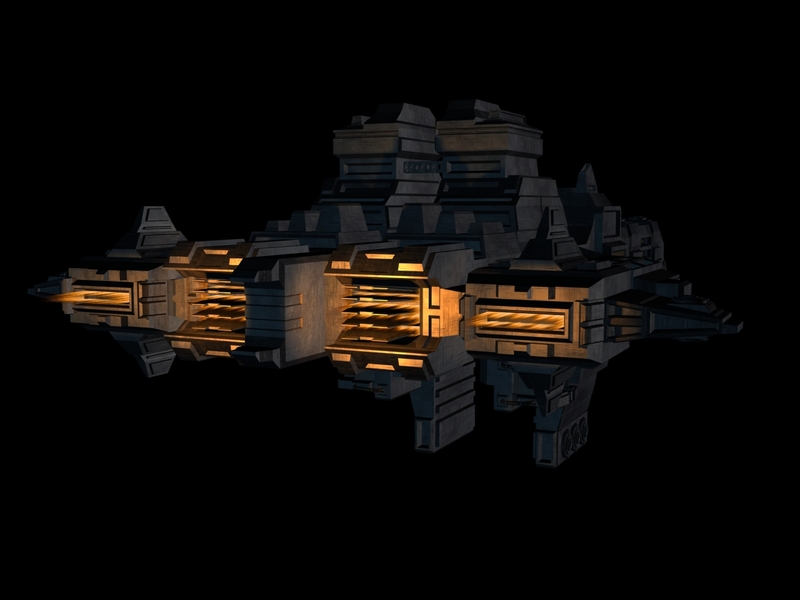 *facepalm* I added some temporary flame effects to the thrusters just to see how it could possibly look later on. 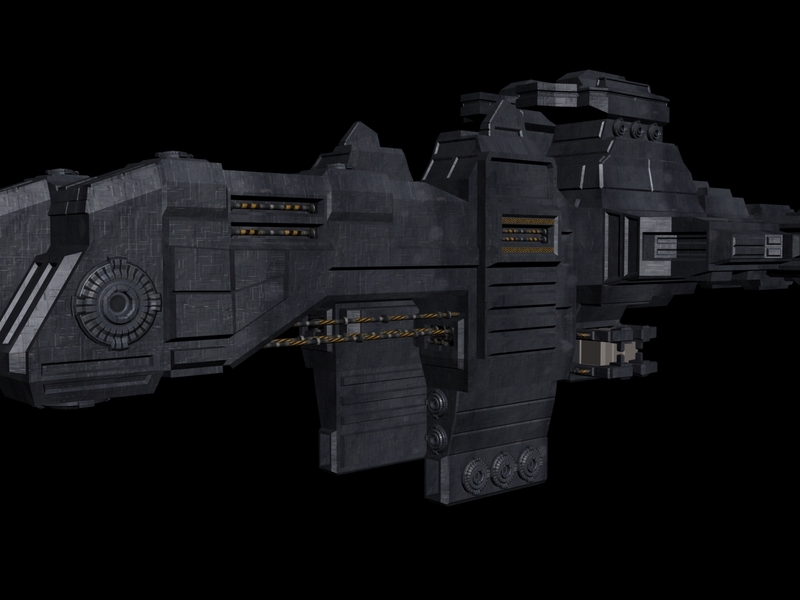 Oh and that crappy texture on the ship is just a placeholder until I fully texture it. The next thing I'll do to this model is probably industrialize it. Yeah, that would totally work, keep up the good work! Your carrier is completely badass (excuse my french). Btw, do you have any ideas for what you would like to name it? It should be twice as badass (I speak french too!) once I get to around the max triangle/vertex count. I'm at 15,772 triangles right now so I'm almost half way to the 32,000 tri limit. Here is the names I like. I like Thor, it has some Hump! to it... But being the mythological Norse god of thunder and all, I think thor is a name suggetive to a ship with emphesis on firepower. Wow that's cool that you can get a ship named after you. Though, I think Zachtroid for the name of a ship sounds lame. For this ship I think I'm gonna go with Thor. Being from direct Scandinavian decent, I'm more into Norse Mythology. Zeus does sound like an awesome name for a powerful ship though. If I make another large ship I think I'll name it Zeus. I'm running into a bit of a problem. For anyone who knows, does the entire mothership texture have to fit on one 2048x2048 map or can you have multiple texture maps? 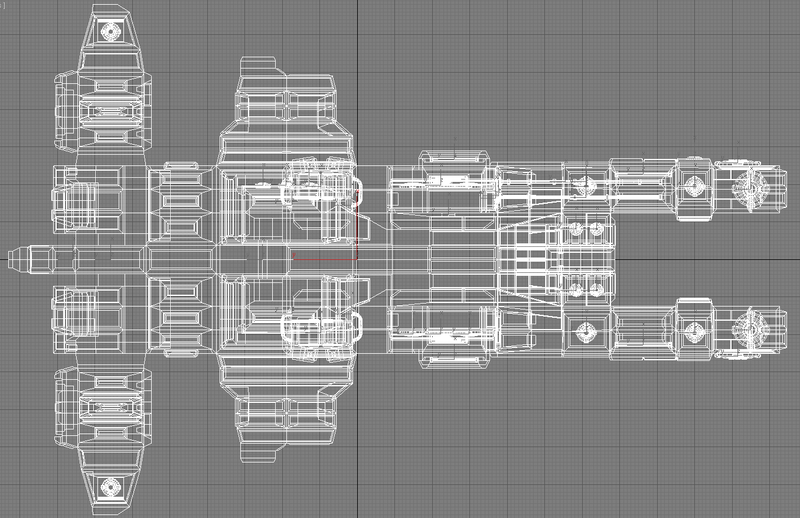 Fitting the entire ship including every single tiny detail onto one 2048x2048 texture map is going look horribly blurry and ruin the overall detail quality on a 2000m long mothership. It would look fine from a distance but the great thing about this game is how up-close you get with ships and other objects. You have to get very close to the mothership considering you'll be docking inside of it. If 2048 is the limit then I guess try think as logically as possible to optimize texture space for UV mapping. For instance inside the hanger currently isn't being used, so bump that right down. Backfacing (If any is close) doesn't need too much resolution. If your still struggling you could make the underside of the mesh to lack resolution (Although this is a 6DOF game, I would still imagine you would see the underbelly less). If you are still struggling to make it not look blurry you can make your normal maps extremely crisp (EVE does that well). And if all else fails you give your file to someone else to take a look at to see if they can get more optimization out of your textures (I would be willing to help if I have spare time). 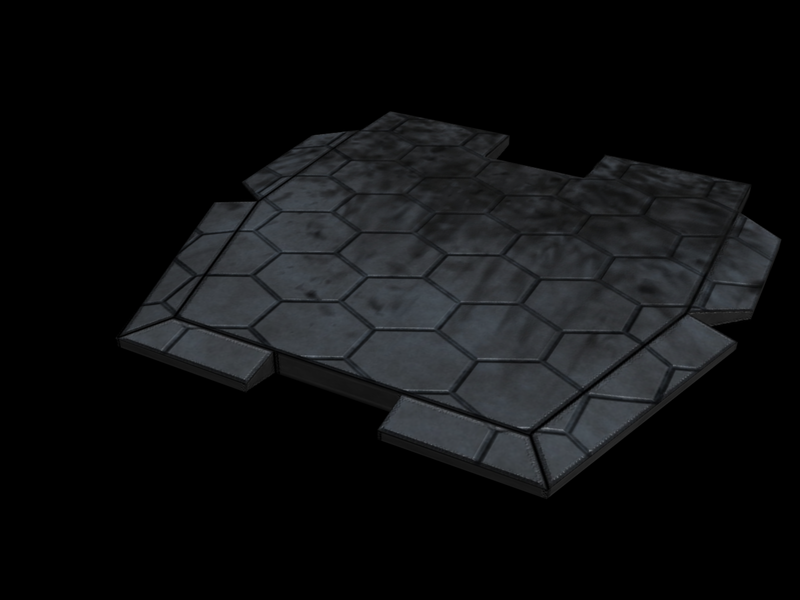 I've been messing with the normal maps a ton today and the texture is starting to look a lot less blurry. I've been experimenting with making the texture at 4096x4096 so I can pay more attention to smaller details then compressing it to 2048x2048 and it results in the details looking a lot more clear. I'm really hoping one of the devs leave their opinion soon because it would be quite disappointing to finish the model then not have it used for anything. 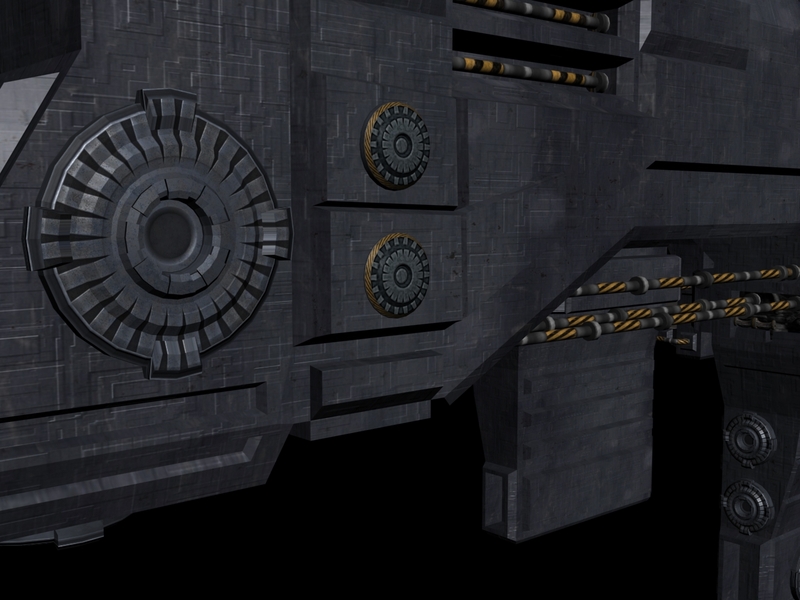 The textures are still just placeholders until I finish the full UV map textures. Here's a wireframe. 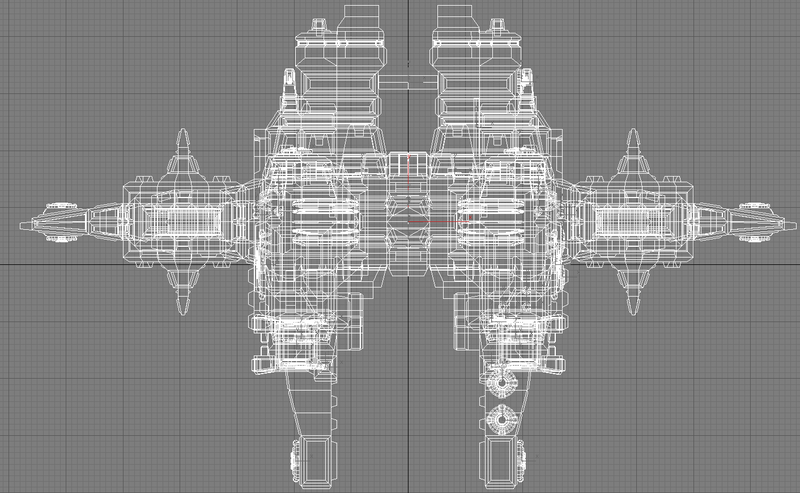 Its a bit chaotic but my eyes are too tired to do wireframe stuff at the moment so I should probably get some sleep. I may post more later if you want. It should definitely end up in-game. 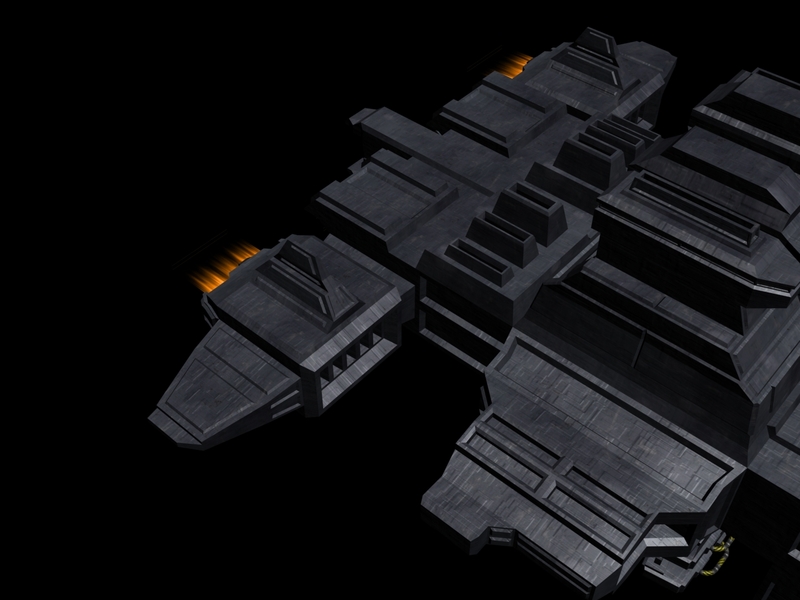 It would be great to have that as a player controlled vessel in the MMO version. I have a quick question for anyone who might know. Does Miner Wars support illumination maps? 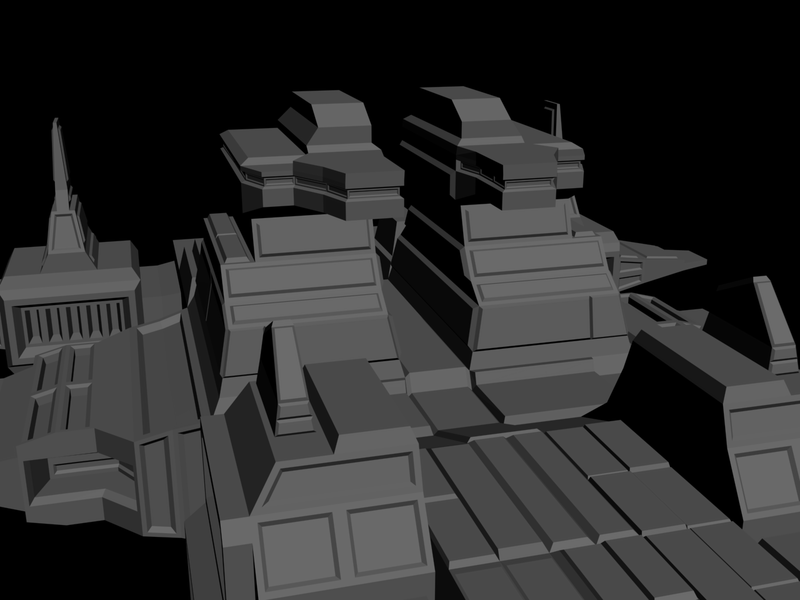 I planned on making illumination maps for lights/windows on the ship. I would just like to know first before I start working on it. That would explain why the placeholders didn't looks finished. :D Thanks for the wire-frame shot more would be appreciated if you've got the time (particularly the solid white area in the back and maybe a side-view/top-down view). damn that IS looking good! Thanks for all the compliments all, I guess I'm doing something right! 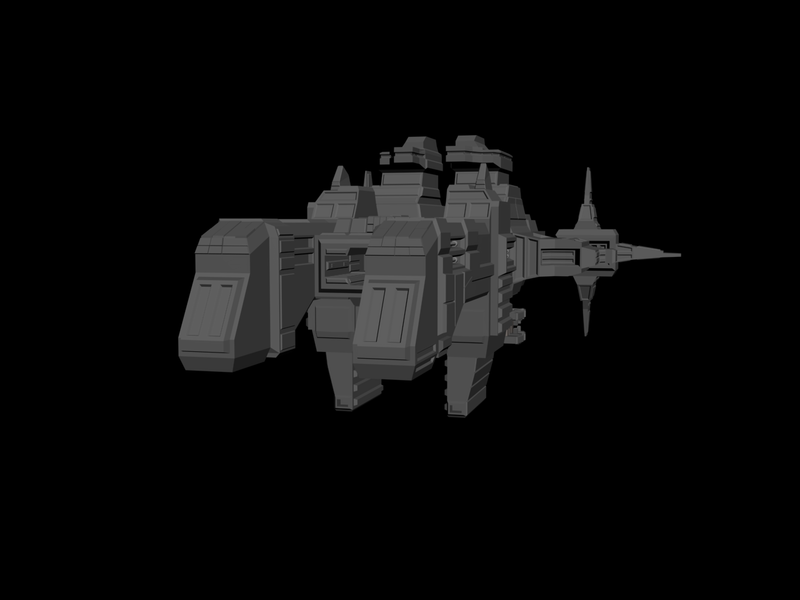 I just got done converting the ship to metric because I forgot to switch over from the generic 3dsmax measurement units to metric when I started. Was kinda a pain but that's all sorted out now. It's 2000m long and I've verified that the collision spheres of smaller mining ships fit into the hangar bay without any problem. My current task right now is figuring out how to keep the triangle count under 32,000. I'm just over 29,500 right now and I still have some more details to put into it. 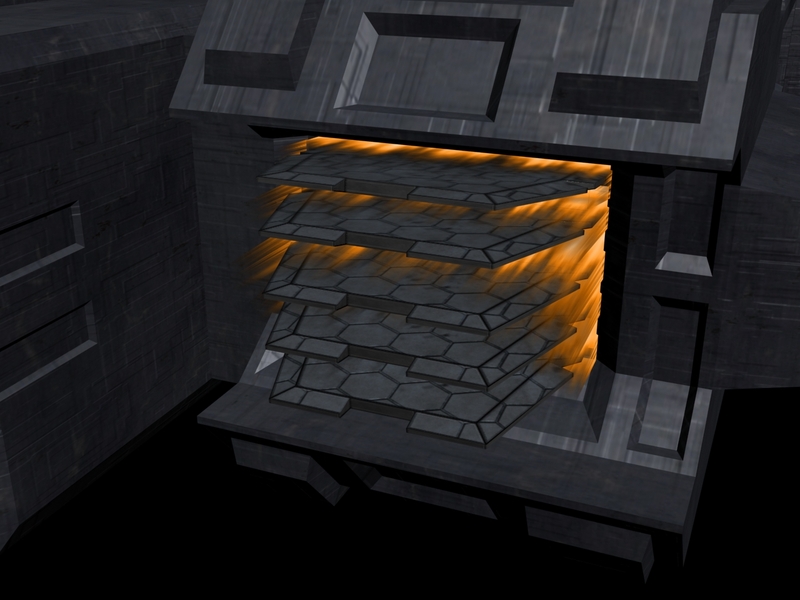 I'll probably get rid of some not very visible, small details and replace them with normal maps. i will say " Hello. My name is Inigo Montoya. You did not include the ship. Prepare to die. Minor suggestion, and hello all. Instead of the gratuitous black and yellow "don't fly into this" warning paint how about a subdued red glow along the pipes? Nothing says 'ominous' more than a red glow. ;) Otherwise, looks great! (edit) No defense turrets, yet? Looks really awesome so far, keep at it! Bravo sir :D Quite amazing i must say! 3D Studio Max may be the program which is a industry standard and cost $3500. You may also get it for free if you are a college student with a .edu email. wow 13 months ago he posted those pictures.... sooo does that mean it's done now? Actually, Ethan, it suffers from a LOT of the same things your model did. Look again, more closely. 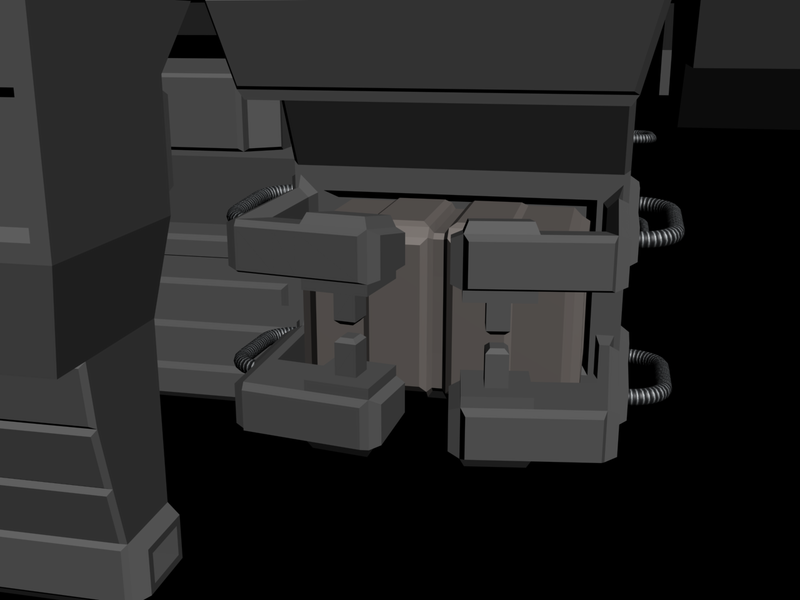 You'll see a lot of simple extrude-and-scale "armor plates", and other lazy detailing.